Considering Santa Barbara’s remarkable susceptibility to wildfires and the resultant destruction of hundreds of homes in recent years, we seem to have two options: move ASAP, or fireproof our lives. Remarkably, the latter of these options may not be as impossible as it sounds. The growing popularity and geographical spread of TimberSIL, which is being advertised as the most fire-resistant treated-wood product to date, may just be exactly what it takes for Santa Barbarans to fear not the fire. The “wood” is a combination of Southern yellow pine and amorphous silica (basically, wood and non-crystalline glass). It is resistant to fire, insects, and rot, is environmentally sustainable and nontoxic, and feels and functions almost exactly like traditional woods-except it is stronger and more supportive. TimberSIL is based in Virginia and has more than a dozen distribution centers throughout the U.S. The one in Placentia, California, managed by Matt Forsythe, is the first on the West Coast, and the implications could be revolutionary for environmentally conscious regions susceptible to wildfires and earthquakes. The creation of TimberSIL was inspired by a burning garage. Around a decade ago, Karen Slimak, an environmental pharmacologist, and her son Robert watched as their garage burned down. Soon after, her son commenced a project to compete in a junior high school science fair, intending ideally to create a fire-retardant wood that would presumably have prevented their garage from burning. The result was a C minus and grumbling about the unrealistic, far-fetched idea. But the revolutionary product was here to stay. Slimak, whom Forsythe refers to as “the modern-day Galileo,” “an extremely brilliant woman,” and “the smartest person I’ve ever known,” eventually had the wood patented. TimberSIL has withstood temperatures up to 2600Â° F. To put this into perspective, at 390Â° F, the average log will dry out and slowly undergo pyrolysis, extreme heat-induced chemical breakdown-not quite burning. Wood will reduce further to charcoal in temperatures up to 530Â° F, but in order to flame, wood requires between 530Â° F and 930Â° F. Wood spontaneously ignites around 1000Â° F. While a typical campfire might rest around 600Â° F or 700Â° F, the erratic flames of, say, the Tea Fire of November 2008, or the Jesusita Fire of May 2009, probably lingered somewhere in the thousands. The average forest fire will engulf and leave any given area within 20 minutes. So if the structures on your property don’t catch on fire after 20 minutes of raging wildfire, they stand a good chance of being preserved. Various tests have been done to establish that a structure made of TimberSIL wood can resist catching on fire for 20 minutes of raging wildfire, therefore potentially preserving your garage, porch, or home. 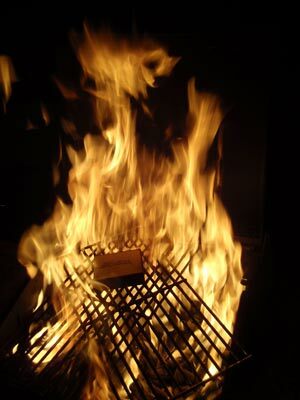 The company conducted an official experiment involving a deck made of TimberSIL with charcoal on one side and gas on the other, surrounded by flammable brush. The goal was to catch the front of the deck on fire and get it to spread. Experimenters held a 2600Â° F torch directly to the deck for 19 minutes until they ran out of gas. The result was a clean hole burned straight through the wood, devoid of charcoaled marks. The flame went straight out when the torch blew out: It was not sustained by the TimberSIL. Suspicious, I located a barbecue and tried to burn some TimberSIL myself. I carefully placed two small samples about three inches above the simmering charcoals that would soon grill some burgers. At upward of approximately 600Â° F, the wood almost immediately began to scorch. 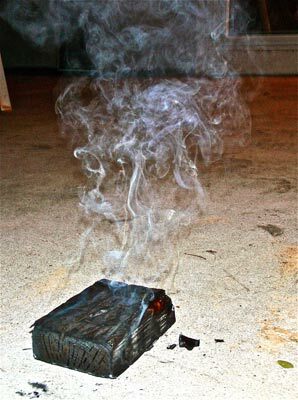 It was not until the wood was placed in immediate contact with the sweltering, orange-black coals, where the temperature was doubly hot, that it really picked up a flame. I removed one piece after 10 minutes, and, upon placement in the damp grass, the relatively unchanged but blackened sample merely smoked. The other piece broke down slowly but definitely over the next 10 minutes among the coals; it was the only thing in the barbecue that was clearly flaming. After 20 minutes total, the wood did not hold a flame but fell into many disintegrated, thoroughly burned tiny pieces of black charcoal-like material-much weaker and deader than I had thought possible. Forsythe was not surprised by my experience: He pointed out that TimberSIL will, of course, break down with extreme temperature. “The point is that it withstands extreme heat much better than regular wood.” Indeed, normal wood in the same situation catches fire immediately and burns more thoroughly and wildly. He added the story of another experiment involving an intrigued customer. A man soaked a piece of TimberSIL in gasoline and heated it in his wheelbarrow. It got so hot that it melted and destroyed his wheelbarrow, but the wood was undamaged. He said most people experiment by placing a piece in their fireplace or woodstove with other woods: Surrounded by flame and other burning wood, TimberSIL will appear to be on fire, but as soon as the gas is turned off, it returns to its normal, non-flame-sustaining state while other wood burns to nothing alongside it. In more official terms, TimberSIL has a flame spread rating of 8.6, deeming it class A. Forsythe explained that to assign these ratings, the California State Fire Marshal (or designee) places a torch at the end of a 30-foot 2×4. An emulated wind blows the flame down the length of the wood. Distance traveled by the flame is measured. If it goes more than 10.5 feet, then it is class B. The test was designed such that no product was ever determined to be class A, until TimberSIL came along. 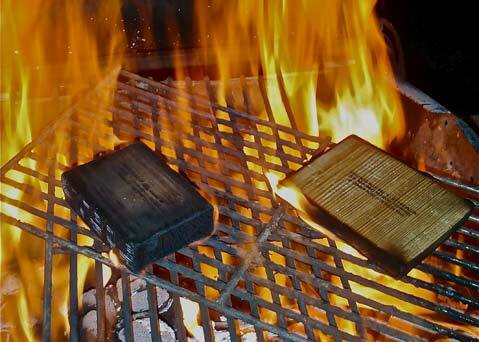 It is also the only wood product approved by the California State Fire Marshals for ignition resistance. To achieve this difficult status, wood is put through 10 years of accelerated weathering by soaking, freezing, and sunning and then burned. But TimberSIL, of course, did not burn. Poire said that he personally “would not build a whole house, foundation, and inside walls and everything” with TimberSIL, but he would absolutely consider it for decking or other outdoor construction. The foundation and walls of a house would still be better if made from concrete, he said, or another material other than wood, even the least burnable wood. TimberSIL is made by embedding a sodium silicone-based formula – basically glass in its liquid form – into wood. When the liquid glass is inserted via high pressure, the glass encapsulates the wood fiber cells so that each is wrapped in glass, more than doubling the wood’s initial strength. The mention of glass in construction aroused my suspicion, but Forsythe explained why TimberSIL is safe. There are two types of glass: crystalline silica, which is extremely harmful if broken or inhaled. This is the glass contained in fiber cement. It breaks into tiny shards or fibers that embed themselves permanently into lungs and skin. Amorphous silica is the other type of glass, and its health implications are the utter opposite of its dangerous counterpart; when broken down it flakes into nontoxic dust that is safer to inhale than sawdust, said Forsythe. Amorphous silica comprises TimberSIL. Forsythe went on to explicate excitedly the entirely self-sustaining processes behind the wood’s production. The company uses only recycled wood and rice hulls, which are the once-useless shells of rice grains out of which the engineers at TimberSIL have figured out how to make sodium silicone. But here’s the best part: The process produces such extreme heat that sufficient energy is generated to run the whole factory. TimberSIL’s production could not be more efficient. TimberSIL is even more attractive when compared with its now-banned, toxic predecessors. Until about five or six years ago, a treated wood product known as chromated copper arsenate (CCA) owned about 95 percent of the market. CCA wood did not rot and was good for water contact, at least until its chemicals finished seeping into the surrounding environment about eight years after construction, at which point the rotting wood demanded replacement and the chemical seeping process would restart. Treated with chemicals with the likes of arsenic, CCA-treated wood was not only still flammable but it was dangerously toxic. The EPA officially banned the manufacture of residential CCA-treated wood products in the United States in 2004, opening up 95 percent of the market to relatively safe but similarly treated wood products and TimberSIL. Non-CCA chemical-treated woods may soon face a similar fate. For decades, the EPA has tolerated but not approved of such woods simply because there has been no alternative to the greenish, chemical-filled, short-lived, and toxin-leaking pressure-treated woods. Just look at the back of the warning label on chemically treated woods, and you will discover a horror story. TimberSIL, the first treated wood ever to be approved by the EPA-about a year ago-as a barrier against insects, may be the alternative that leads to their final ban. It is difficult to get a firm grasp of how relatively expensive TimberSIL is. Because it is twice as strong as your average building wood-say, Douglas fir-not as much wood is required to construct a sturdy deck or other large wooden structure. Using TimberSil for the deck still might still cost more initially, but considering its durability, the long-term price is likely lower. Unlike other wood, it can also be painted or stained immediately because it does not require the typical year that others do in order to shrink to its stable mass. In 2005. TimberSIL received the Popular Science Grant Award in the “Best of What’s New in the Home” category. It continues to spread from the East Coast throughout the United States and Canada, and now boasts a partnership in China. There is also talk of using TimberSIL on railroads in Europe in the near future. Keep your eyes peeled for its use in everything from decks and garages to railroads and piers-and fear not the fire.